Boxed Votives Votives may be small but they are not small on fragrance. They are packaged in a decorative box that makes them great for gift giving. 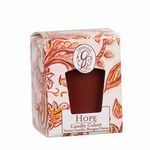 Votives will burn for over 15 hours when used in votive holder or an appropriate container. Click the links below to go shopping.